Does it make sense to write a review of a book you'll never read? Maybe. I got this nice little book for Christmas and would like to share it with you. It's about Chuck Berry, kind of. But unfortunately it's available in German language only. Bissingheim is a suburb of Duisburg which itself is a suburb of the largest megacity in Germany, the Ruhrgebiet. Duisburg is best known for having the world largest in-land port. "Chuck Berry over Bissingheim", subtitled "The true story of rock and roll", is a 2017 book by Frank "Zepp" Oberpichler. Oberpichler is a German musician and writer. 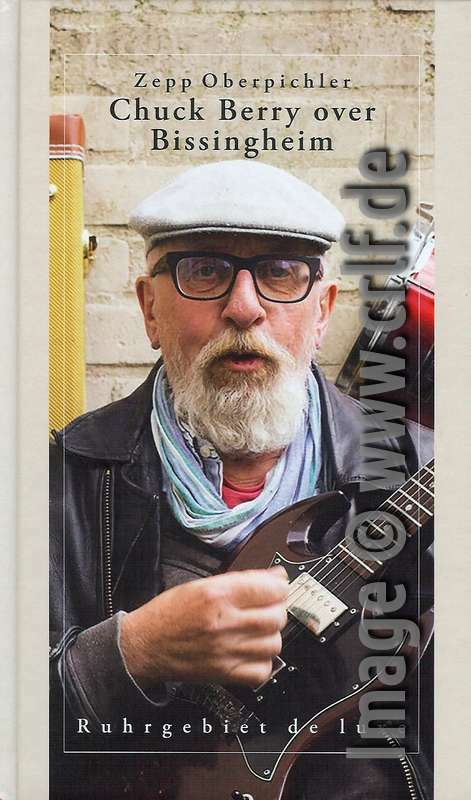 He played guitar in various cover bands such as "Ten Beers After", "Substitute" or "Freeway Cash" and published some CDs alone and with US or German musicians. His homepage is at http://www.oberpichler.de. In "Chuck Berry over Bissingheim", the first-person protagonist tells about his Grandpa ("Oppa") Wallusch, an electrical engineer working at the railroads. Oppa Wallusch just passed and his grandson remembers the stories they shared. So we learned that while Bissingheim was never on the tour plan of any famous rock band (or any unknown highschool band either), Bissingheim was indeed the birthplace of Rock'n'Roll. Oppa Wallusch learned to play guitar in the early 1940s while staying in England during the war. He got friends with an American Blues musician by the name of Big Joe Turner. Back home Wallusch formed a band which on weekends played at weddings and barn dances near Bissingheim. Here Oppa Wallusch merged Blues with Polka dance music and created what he called "Ruck und Roll". Over the years, his employer sent Wallusch to England and to the States several times and wherever he went, Oppa Wallusch left his traces by educating young musicians or helping them write famous songs. Together with Jim Marshall he invented the guitar amplifier and taught Jimi Hendrix and Pete Townshend how to use it. Wallusch met Woody Guthrie and Jerry Garcia, was on stage at Woodstock and shaped rock music as we know it. A whole chapter covers Wallusch's stay in Chicago in the late 1940s where he met and educated Chuck Berry on how to do the "Ruck und Roll", how to play guitar and how to write story songs. The book is a report of Wallusch's talks with his grandson. But concurrently the book is its own soundtrack album. The chapter headings read Track 1 to Track 11 (along with run-in and run-out). Each chapter starts with a quote from a famous railway song (which Wallusch might have been involved in). And each chapter includes the lyrics of a German-language song Wallusch wrote and which is very close to a hit you might remember. Unfortunately no recordings of Wallusch's originals survived. Track 11 is a song about a guy trying to get a number from the operator to get his loved-one on the phone. The lyrics end explaining that the guy is trying to phone his daughter, not his girl-friend. Wallusch's song is called "Meiderich - Kennen Sie?". (Meiderich is another suburb of Duisburg, "Kennen Sie" is German for "Do you know".) And, believe it or not, Chuck Berry took Wallusch's idea and melody to create a famous English-language version. Oberpichler's book is a nice read. It could have used less slang, though. I guess even many Germans will not fully understand Wallusch's recollections. But mainly I wish the book would have been longer: Just eleven tracks are much too short for a soundtrack album nowadays. If you can read German, get yourself a copy at your local bookstore using the ISBN 9783942094726. The book is also available at amazon.com or amazon.de. Recommended.